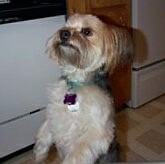 "This is Cody my male Lhasa Apso / Yorkie mix at 1 year old weighing 16 pounds from Sunny Terrace Kennel. He is the most thoughtful little guy. At night, he gives me a thorough "face wash" and if I leave his sight, even for just a moment, he'll stop what he is doing, and look for me to see if I'm ok. He's just a big furball of love." The Yorkie-Apso is not a purebred dog. 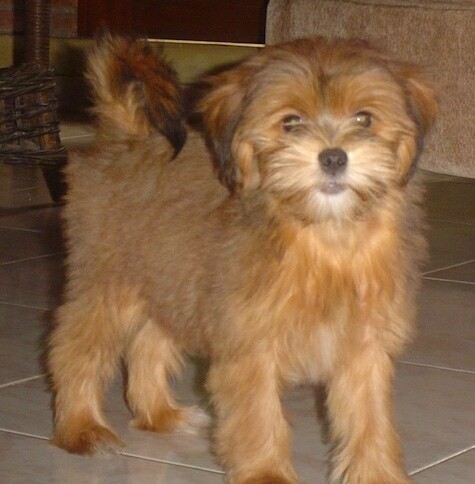 It is a cross between the Yorkshire Terrier and the Lhasa Apso. The best way to determine the temperament of a mixed breed is to look up all breeds in the cross and know you can get any combination of any of the characteristics found in either breed. Not all of these designer hybrid dogs being bred are 50% purebred to 50% purebred. It is very common for breeders to breed multi-generation crosses. 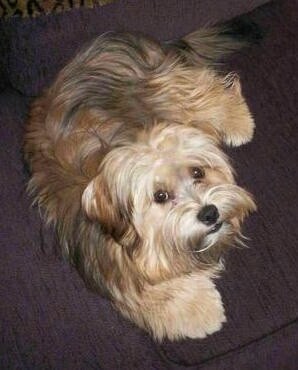 Cody the male Lhasa Apso / Yorkie mix at 1 year old weighing 16 pounds from Sunny Terrace Kennel. 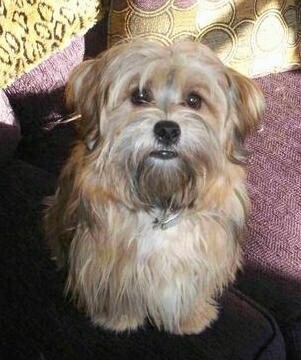 "Cody the male Lhasa Apso / Yorkie mix at 1 year old weighing 16 pounds from Sunny Terrace Kennel. This picture was taken after his haircut. He doesn't seem to mind, the summers here get very hot!" 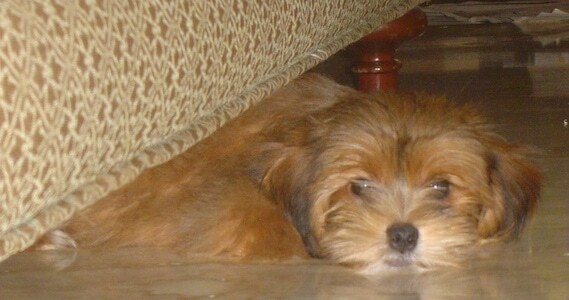 Bibi the Yorkie Apso puppy at 3 1/2 months old. "This is Daisy. 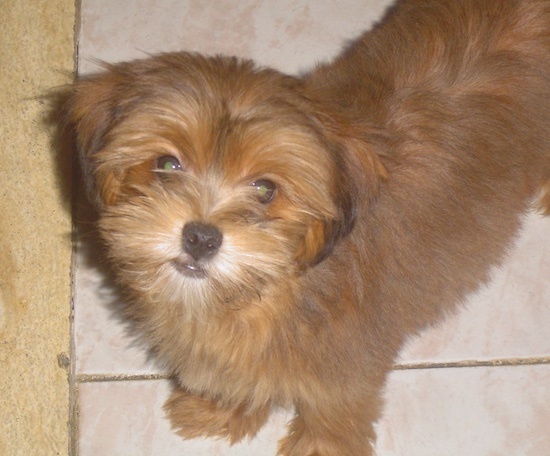 She is an 8-month-old Yorkie Apso puppy. Her mum was a Yorkshire Terrier and her dad was a Lhasa Apso). She was our first puppy and is my little princess. She's tiny but has a big voice, although she only barks when someone passes the window or knocks on the door. She seems to be rather intelligent and was easy to train. She, like her younger brother Rufus the Maltichon, loves cuddles but is very energetic. Her favorite toy is her squeaky ball constantly playing fetch and bringing it back with her tail wagging. She is so adorable and everyone who sees me walking her comments on how beautiful she is and asks what breed she is as she obviously isn't a full Yorkshire Terrier due to her floppy ears and her tail that curls over up her back. She gets a half hour walk every day round the local lake with her big brother Rufus, but we joke saying shes like a Duracell bunny as she could keep on walking forever! She is definitely the boss between the two as we got her two months before we got Rufus so she rules the roost. But she took to him really well and we are are very pleased how much they get on together and how much they love each other. She is also very good with children and is especially attached to our nephew Riley just saying his name makes her tail wag. Daisy seems to have got the best characteristics of both breeds and it does help that her mum and dad both have excellent temperaments. She is a brilliant dog." Daisy the Yorkie Apso puppy at 8 months old. Layla, a Yorkie-Apso at 11 months old, weighing 6.5 pounds—"The mother was Lhasa Apso and the father was Yorkshire Terrier." 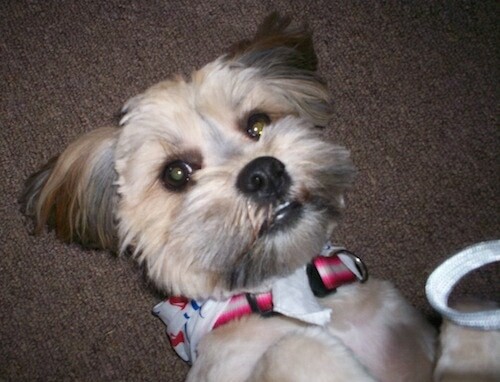 This is Lucky, an adorable Lhasa / Yorkie mix owned by the producer of the Radio Delilah Show.